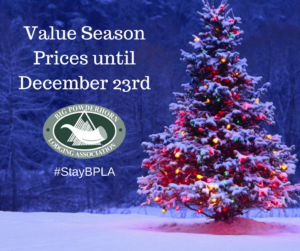 HomeSpecialsValue Season Prices until December 23rd! ALL our units still offer value season pricing until December 23rd! That means you can take advantage of the early season snow at a discounted price! Weekday/Weekend nightly rates start as low as $105! The downhill ski resorts are opening soon so come and take advantage of the FRESH SNOW!! Indianhead Mtn Resort is re-opening Dec. 16th! Big Powderhorn Mtn Resort is opening December 16th! Blackjack Mtn Resort is opening December 16th!